The Fallschirmjäger (German) were the paratrooper (German: Fallschirmjäger) branch of the German Luftwaffe before and during World War II. They were the first German paratroopers to be committed in large-scale airborne operations and came to be known as the "green devils" by the Allied forces they fought against. The Fallschirmjäger were very effective when used in commando style raids. This kit comes in a shrink-wrapped end opening type box. I am no fan of this type of box, because invariably parts or the decal sheet find their way past one of the end flaps to become lost forever. Give me a tray and lid type box any day of the week. The box is blousy and too long. There is a void at one end of about 4". 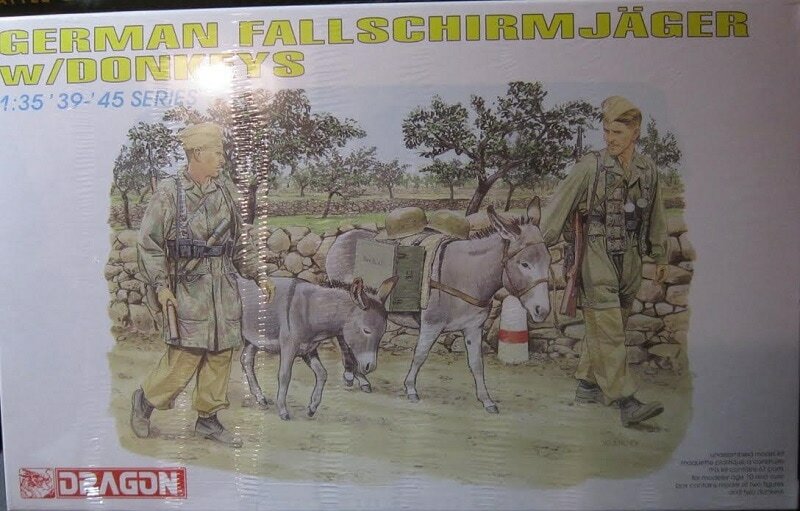 The box art shows 2 fallschirmjagers (paratroopers) leading two donkeys down a dirt road past a stone wall that is around what looks like an orchard. They each wear knee length camouflaged smocks. Their pants are bloused into their shoes and they have soft side caps on their heads. Both have black belts with ammo cases slung on them. One has a length of canvas ammo cases slung around his neck and two potato masher type grenades tucked under his belt. He is leading one of the donkeys. The other donkey is loose and not wearing a harness like the one being lead. The one being lead has a quilted cloth over his back with 2 steel helmets and a large case slung over it. 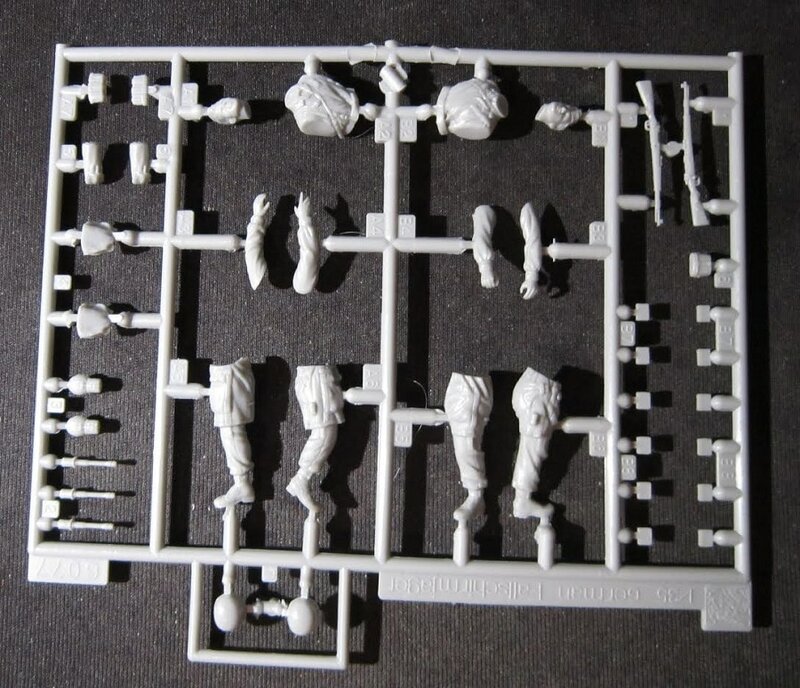 One corner of the box art says that the kit is designed for modelers 10 and over and that it contains 71 parts. One side panel of the box shows color box arts for 2 other figure kits that DML manufactures: kit no. 6074, German Medical Troops and kit no. 6076, German Sturmpionier Assault Raft (Kleiner Kobsack 34). ​This is followed by the warning that the kit is not for children under 3 due to small parts that they may accidentally ingest and that the kit is intended for modelers over 10, in multiple languages including English. 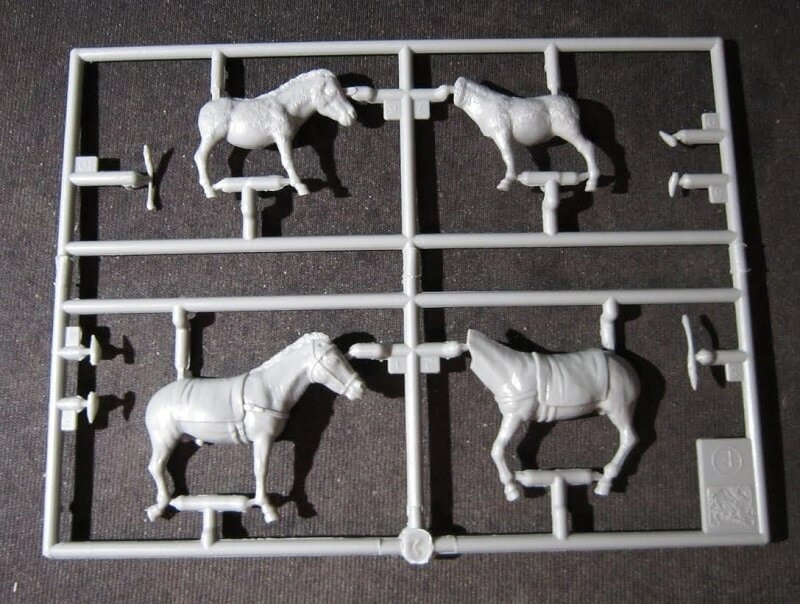 The other side panel says that the kit contains parts for 2 figures and two donkeys. Glue and paint are not included, in 6 languages. The copyright of the kit is 1997 and Dragon's stree address in Hong Kong, China is provided and the kit was made there. The back of the box serves as the assembly and painting instructions. There is a 2-view illustration of the 2 figures and the 2 donkeys and a color swatch showing the camouflage pattern of the smocks. All the illustrations on the box are by DML's resident artist Ronald Volstad. The kit contains 3 light -grey trees of parts inside 3 sealed cello bags. The largest light-grey tree is labeled as letter A, but only on the assembly instructions on the bottom of the box. Not on the tree itself. The detail and molding on these kits is very good. This set will make a very interesting diorama.